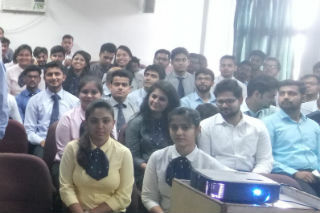 A special session on understanding the complexities of Goods and Service Tax was conducted for PGDM Year I students of Section A and C on 22nd July 2017. Mr. M A Mateen, Senior Vice President, Berger Paints lectured and enlightened the students about GST and its implications for business. In a very informative session, Mr. Mateen shared real life examples with the students for making the understanding easy. He simplified the discussion with an example of a hundred rupee note and compared the amount of tax before imposition of GST and afterwards. In the later part of the session a number of queries of students were passionately answered by Mr. Mateen. The session concluded as Mr. N.P. 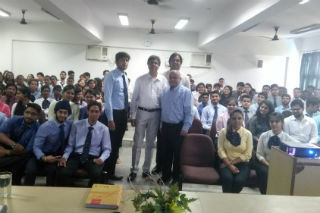 Singh (Faculty member) proposed the vote of thanks to Mr. Mateen and the keen listeners.